For overall handling and image quality, the Tamron performs as well as other superzoom lenses like the Sigma 18-300mm and Tamron’s own 16-300mm, despite its extra-long maximum focal length. Here’s a funny thing. People buy a DSLR so that they can use interchangeable lenses, then they want a single lens that does everything. Available in Canon and Nikon mount options, Tamron’s latest all-in-one ‘superzoom’ lens comes closer than most to that goal, stretching from fairly generous wide-angle coverage to an unprecedented 400mm ‘super-telephoto’ focal length – on Canon and Nikon APS-C format bodies, that’s equivalent to using a 600mm or 640mm lens respectively, on a full-frame camera. One of the main attractions of any superzoom lens is that it’s convenient for travel photography. Whether you’re pounding city streets on a mini-break or climbing mountains, one thing you won’t really want to take along is a heavy bag full of lenses. The Tamron works well as a travel lens because, as well as delivering the same kind of zoom range as two or three regular zoom lenses, it’s also reasonably compact and lightweight; indeed, at 710g the Tamron feels well-balanced when mounted on Canon or Nikon APS-C format bodies, and doesn’t feel unduly big or heavy, even if you’re carrying it around all day. Along with the record-breaking zoom range, there’s a new-generation autofocus system with an HLD (High/Low torque-modulated Drive) motor. It’s virtually silent in operation and well suited to both stills and movie capture, delivering speedy performance for stills and smooth transitions for movies. Another headline feature is optical image stabilization, or VC (Vibration Compensation), as Tamron calls it. Canon and Nikon cameras typically don’t feature sensor-shift stabilization, although Canon has introduced video stabilization in the EOS 77D. That makes optical stabilization pretty much essential for handheld shooting towards the long end of the Tamron’s zoom range. 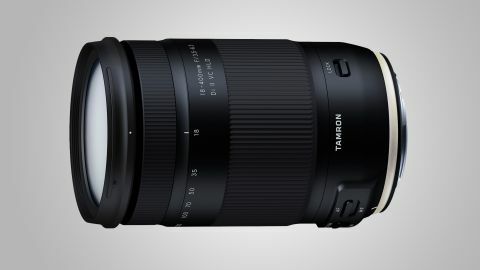 Rated at 2.5 stops, the VC is good, but not as great as in some other recently launched Tamron lenses, such as the Tamron SP 24-70mm f/2.8 Di VC USD G2, which have a five-stop rating. Despite being fairly lightweight, the lens feels quite robust and solid, from its weather-sealed metal mounting plate through to the supplied petal-shaped lens hood. Despite having no less than four concentric sections in its telescoping barrel, the construction feels firm and wobble-free. The zoom ring operates reasonably smoothly, but requires different amounts of rotational force as you progress through the range. There’s a lot of extension too, with the lens stretching to 25cm (10 inches) at its longest zoom setting. Zoom creep is fairly minimal, and only really an issue when you're shooting practically vertically upwards or downwards. A zoom lock switch is fitted to avoid accidental extension while you’re carrying the lens around. The switches for auto/manual focus, and VC on/off are nice and large, and easy to operate even if you're wearing gloves. One downside to handling, however, is that the manual focus ring rotates during autofocus, so you need to keep your fingers clear, although it's not as much of a problem as it could be, because the focus ring is at the front end of the lens; a bigger concern is that the autofocus system doesn’t enable manual override. On the plus side, with a fully internal focusing mechanism, the front element doesn’t rotate, so it’s easy to use filters like circular polarizers and ND grads. Autofocus and aperture control proved consistently accurate in our tests. Electromagnetic aperture control is used in the Nikon-fit as well as the Canon-fit option of the lens. It’s mostly a good thing, compared with the mechanical lever used in most Nikon-fit lenses, but a downside is that it makes the lens incompatible with older Nikon APS-C cameras, up to and including the D300s, D3000 and D5000. Superzoom lenses are somewhat notorious for compromising image quality in favor of outright zoom range. The new Tamron is no exception, but sharpness is maintained fairly well throughout the entire zoom range, for this type of lens, right up to its 400mm extremity. Color fringing is well controlled through most of the zoom range, but becomes noticeable at the long end, especially on Canon cameras where, unlike with Nikon bodies, it’s not automatically corrected in JPEG quality modes. Similarly, barrel and pincushion distortions are clearly visible toward the short and long ends of the zoom range, respectively. For overall performance and image quality, the Tamron performs as well as other superzoom lenses like the Sigma 18-300mm and Tamron’s own 16-300mm, despite its extra-long maximum focal length. However, what you gain in telephoto reach you lose in ultra-wide viewing angle, which is still a major plus point of the older Tamron 16-300mm, a lens that's is unique in this respect. The autofocus system of the 16-300mm also has the handling benefit of its focus ring remaining stationary during autofocus, while enabling manual override.